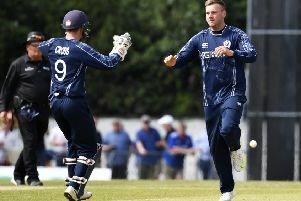 Carlton cricketer Ali Evans and the three other Capital-based players in the Scotland squad cannot wait to test themselves against the best at the World Twenty20 cricket event in India. Scotland’s first group match is not until March 8 against Afghanistan, but they flew to India yesterday to begin a period of intense training and warm-up fixtures. Fast bowler Evans, 27, is joined in the squad of 15 by Preston Mommsen (Mazars Grange), Mark Watt (Heriot’s) and George Munsey (Mazars Grange). After the Afghanistan match they take on Zimbabwe and then Hong Kong in Group B and, if they can come out on top in that section, they would then take on the likes of England in the Super Ten phase. Evans believes the way the squad played in the qualifiers last summer in Scotland and Ireland has given them great belief that they can compete on the world stage. “We knew going into the qualifying event that we would come up against some tough opponents and in the middle of the campaign we had a bit of a blip, but we regrouped and the way that we fought back showed what this team is all about,” Evans, who has played in nine Twenty20 internationals, said. “As a bowler, Twenty20 cricket throws up a lot of different challenges in contrast to the longer formats of the game. Mommsen, a former Carlton team-mate of Evans before he made the switch to Grange a few weeks back, has been skipper of this group of players for quite a length of time and he feels that continuity has made them into a tough unit to beat. The 28-year-old all-rounder stated: “A number of the guys in this group have been together a long time and we want to make the most of this opportunity. I think we have learnt a lot as cricketers since the 50-over World Cup in Australia and New Zealand last year and the guys are now approaching things in a positive manner. Spinner Watt, 19, is the youngest member of the touring party, but he feels at home now in the full squad. “When I first came into the national squad last year it was a bit daunting, but all of the other players and the coaching staff have made me feel welcome and feeling confortable has helped me to progress my cricket to the next level,” he said. Left handed batsman Munsey, who turned 23 on Sunday, is well suited to the shorter format of the game and he will hope to nail down one of the opening batting slots ahead of the Afghanistan match. However, in the qualifiers the coaching staff moved him down the order to try and score some quick runs in the middle overs and they may do so again. Scotland squad: Preston Mommsen (captain), Kyle Coetzer (vice-captain), Ali Evans, Calum MacLeod, Con de Lange, Gavin Main, George Munsey, Josh Davey, Mark Watt, Matt Machan, Matthew Cross, Michael Leask, Richie Berrington, Rob Taylor, Safyaan Sharif.